A GREAT PLANT PICK. 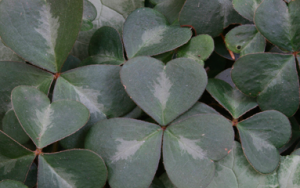 This staunchly evergreen form of our native sorrel has deep green leaves marked with a silver chevron on each leaflet and large pink flowers in spring. Creeps to form an inpenetrable ground cover. To just 4″ tall but spreading to several feet wide within several years. Spreads underground by traveling stolons. A great native small scale ground cover for part shade to even dense shade. Regular summer water is beneficial but not necessary once the plant is up and going. Very easy to grow climate adapted evergreen perennial ground cover. Oregon native plant.